As a consumer, you may prefer bottled spring water to tap water. You’re able to drink with the peace of mind knowing that the water you’re putting into your body comes from the purifying waters of natural streams or springs. Well…maybe. Probably not. Besides the possibility of spring water contamination, as just occurred with Niagara Bottling, the water in your water bottle is less regulated and tested than the water flowing from your tap. If you think the standards of purity are higher for bottled water, think again. Bottled water is regulated by the FDA, whereas city tap water is regulated by the much more stringent EPA. The FDA doesn’t monitor things like E.coli or force brands to submit water quality reports, unlike the EPA. In short, you can be more confident with the quality of your tap water than with the quality of your bottled water. The latest incidence of contaminated spring water involves Niagara Bottling where evidence of E. coli was discovered in one of their spring sources. Since bottled water brands aren’t regulated for E.coli, Niagara Bottling voluntarily recalled their own bottled water products. The company issued a voluntary recall for all bottled water manufactured in Pennsylvania between the dates of June 10th-18th. For more information on the recent Niagara Bottling recall, visit niagarawater.com. You can also contact them directly at (888) 943-4894. Although tap water is better regulated, you may have internal contamination sources, which is why it is important to have your water tested at least once. The best time to test is when you first move into a home. Water testing will help you decide if you need a water treatment system and which system is best for your individual needs. The different systems and subsystems available to you are meant to address specific water quality issues, like chemicals, metals, and sediment. Your choice should be based on what’s in your water and a professional testing is the only way to find out. We base our home water treatment systems, including softeners, filters and treatments on the report you get from having your water tested. 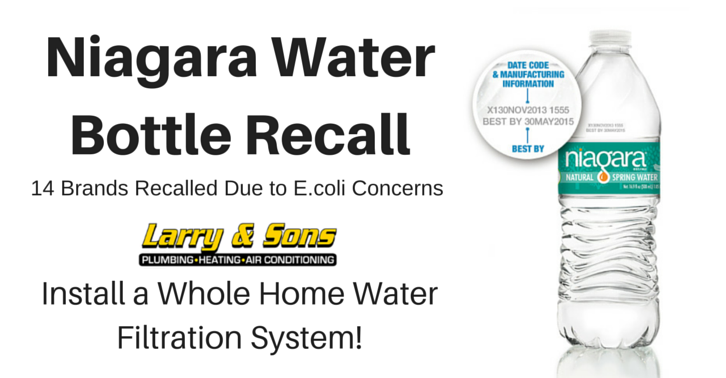 From simple to whole house, we have the home water filtration system for you. No matter your needs, we promise to meet them. You’ll benefit greatly from a home water filtration system – that’s a promise. You’ll love your new water filtration system so much that you’ll never want to drink manufactured bottled water again! Not only will you prefer your tap water, but if you get a whole-house water softening system, your appliances will last longer, your skin will be healthier, and you’ll have zero limescale, white spots, and mineral buildup on your fixtures and dishes. Say goodbye to bottled water forever and hello to a healthier home and family! We’re committed to providing the best home water filtration systems to Maryland, Pennsylvania, and West Virginia, backed by a 100% Satisfaction Guarantee. Follow us on Facebook, Twitter, and Google+ for awesome advice and useful tips!